We have witnessed the coming of a new age. The age of feedback decentralization; a time when anyone can quickly become a critic, and an anonymous review posted online by John Smith in Anywhere, USA can have a profound influence on corporate strategies, cultural firestorms, and moral objectivism. Consumer-generated reviews have a dramatic effect on the success of organizations in the restaurant and foodservice industry in particular. As the National Restaurant Association aptly describes, online reviews are the new word of mouth, carrying as much weight as – if not more than – the words of professional critics, or information found in reference guidebooks. A Harvard Business School study has shown how a 1-star increase in a restaurant’s Yelp rating can lead roughly to a 9 percent increase in revenue. This is a metric that is raising eyebrows, regardless of your system-wide annual sales — $400MM, say, or $1M — the incremental revenue impact is significant ($36MM and $90K respectively, based on a 1-star increase alone), and Restaurant Executives are taking notice when prioritizing projects that impact sales. A half-star improvement, meanwhile, makes it 30 to 49 percent more likely that a restaurant will sell out seats during its peak hours. The latest ReviewTrackers research also shows that 33 percent of diners will not choose to eat in a restaurant with less than a 4-star rating on online review sites like Yelp, Google, and TripAdvisor. If consumers are demanding review content to guide their decisions, there is no shortage of volunteers to supply the information. At the end of the first quarter of 2015, Yelp had collected over 77 million reviews, of which 19 percent (approximately 14.6 million) are reviews of restaurants. Yelp is also particularly strong in mobile search. In the most recent quarter, we saw more than 50 percent of its content (reviews and photos) generated on mobile devices, which helped the Yelp average 79 million unique monthly mobile visitors. Yelp is not the lone player in the online reviews game. There are others – TripAdvisor, Facebook, Google+, MenuPages, Zomato, to name a few – which collect and publish reviews, and give voice to customers who want to share their experiences online. The challenge remains of finding an approach to customer feedback that’s more proactive than reactive. Tracking, collecting, and responding to reviews can definitely protect brand reputation, but what of brand reputation development – efforts that go beyond mere treatment of symptoms? I expect more organizations to ease their technological reluctance and adopt tools that make their reputation – and operation – more profitable. Some continue to gain steam, already a step ahead, propelled by data-driven intelligence as well as the confidence to proactively ask for feedback. This kind of work, of course, requires involvement from not only marketers, SEOs, and social media managers, but multiple roles across the entire organization such as customer support, sales, and executives. With buy-in from all, businesses can use reviews to drive customer experience and effectively engage with their new vocal audience. The restaurant-going experience has changed. Just ask any Google-searching, iPhone-brandishing, Instagram-snapping diner who fires up Yelp to look for restaurants, OpenTable to make reservations, Eat24 to order food online, and Restaurant.com to find meal deals. Thanks to this user-centric technology, and its availability on all screen sizes, there are a myriad of ways to engage with restaurants; all one has to do is click or tap. 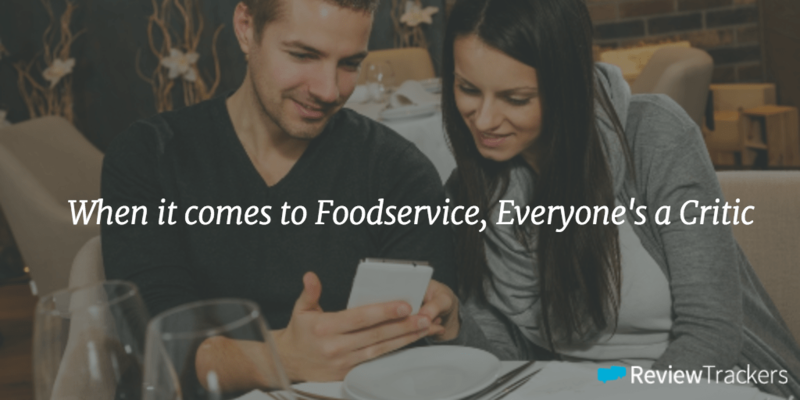 Perhaps technology’s greatest impact on the foodservice industry – the economics, labor force, supply chain, and consumption trends – is most evident in the way today’s restaurant-goers rely increasingly on online reviews. It is a tell-tale sign of a sea change in business culture. As part of a large movement away from traditional marketing to a “brand management” focus, industry execs, as a result, have begun investing resources into managing online reviews and customer feedback. They have started tracking review data, calculating reputation scores; assigning employees to write management responses and training their staff to cater to customers in ways that delight and produce better reviews. According to TripAdvisor’s TripBarometer survey, reputation and review management serves as one of the top investment priorities for hospitality organizations, outranking marketing and advertising efforts. It’s an industry trend that signals a new age of decentralized social feedback, the likes of which haven’t been seen before. Great read, we are excited to have you as part of the ReviewTrackers family. This trend has become a bit annoying nowadays. I mean, the phrase “food critic” has completely lost its meaning I think and everybody has that urge to do just that – criticize. For heaven’s sake – it is actually implied by the phrase! And now, everyone’s an expert. Just to clarify, I do not own any food-related establishment. This is just something I noticed. And I don’t believe these restaurant’s reviews; I’m just sorry for those whose business and hard work is “dramatically” affected by some spoiled customers waking up on the wrong foot that day. Tracking really helps with the business. When you know what the most of your customers want, you can easily satisfy them. Tracking your online reviews can greatly benefit your business. You allowed to find out all that is bad or good about your business and you can embrace those reviews to make your business even more successful. If you gain a bad review, don’t get upset, but work on the parts that were actually criticized and make them better. Also, responding to critics and reviews is important as well. I swear, managing a yelp page has become more complicated than dating… and that’s had the greatest minds puzzled for thousands of years.